Not content with announcing that it is to enter the Blu-ray player fray, Onkyo is also trying to corner another market, the 'affordable' home cinema sector. The company's latest release is a new home cinema setup that consists of a DVD player, receiver and 5.1 surround system. The DVD player (titled DV-SP406) is an entry-level system that contains 1.1 HDMI compatibility, upscales to 1080p and comes complete with USB playback for a number of audio files. Next up is an HDMI-equipped, 5 x 130W home cinema receiver. Named the HT-R518, the system includes such features Audyseey Dynamic EQ, three 1080p HDMI pass-through inputs and one output, and Music Optimiser which enhances compressed music files like MP3s. To partner the receiver is a 5.1 surround setup. 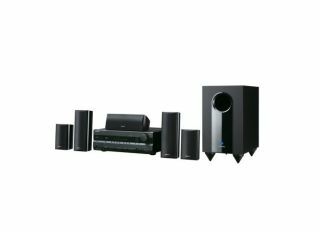 This consists of five magnetically-shielded speakers – two-way front channel/centre-channel speakers and full-range surround speakers – plus a 90W active subwoofer. The receiver and speaker set (which is available in both silver and black) will set you back £350, while the DVD player will cost £100. If you buy the lot, however, you will save yourself £50, which by all accounts isn't too bad at all.